Wake up – it’s a beautiful morning! This will probably be the most important morning of your life so you will want to wake up to colour and light, whilst considering the ceremony of the day ahead. 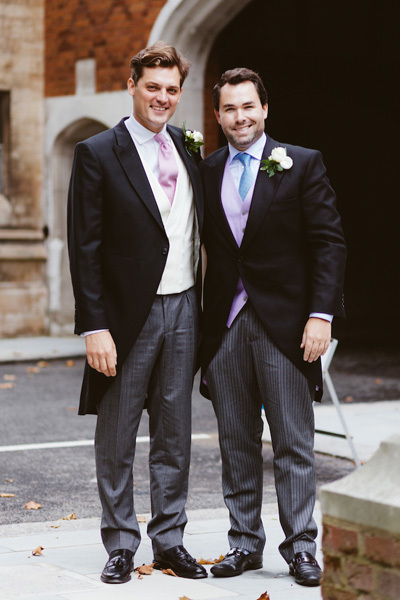 So, although you may wish for continuity with the morning or wedding suit itself, there are some exciting ways of mixing and matching the colours of the ties/cravats and waistcoats of the groom’s party. There are some beautiful lilacs, lemons, ivory and indigo colours to select – the world really is your oyster (another good colour) on this momentous occasion. A selection of subtle shades enables you to bring a rosy blush to the groom’s attire – to match the blushing bride! Made with a canvass, our morning suits are made and cut in England. As with all photographs on our website, to the left are actual customers in actual Henry Herbert morning suits. As with every suit we make, they take 8-9 weeks to make – we have a half way baste fitting and then a forward baste fitting before the suit is finished and delivered. See also: bespoke morning suit, classic morning suit, mens morning suit, morning suit, morning suit jacket groom, morning suit london, morning suit waistcoats, royal ascot morning suit, savile row morning suit, wedding morning suit, what is a morning suit?. Wake up – it’s a beautiful morning! - Bespoke Suits By Savile Row Tailors.